RO or Nano – What’s the Difference? Reverse Osmosis and Nanofiltration are water membrane filtration processes designed to lower your parts per million (PPM) or total dissolved solids (TDS) in your brewing water. Both of these processes will deliver consistent water quality and both work the same way. The filtration function is achieved by forcing water through a semi permeable membrane. The water passes through the outer wall and into the center of the membrane where small pores allow most of the water molecules to pass. However, some of the ions in the water cannot pass through these pores. As a result of this process you have water with very low TDS levels when using RO membranes and higher TDS levels when using Nano membranes. The difference between the 2 membranes is the size of the pores in the membranes. The pores in the nano system are much larger which will allow more water to pass through. But as I say for every action there is a reaction, and for nano you will receive a smaller rejection percentage. For example if your feed water TDS is 400 ppm you can expect your nano system to produce water quality between 40 and 60 ppm. The reverse osmosis system with the same feed water will produce under 10 ppm. This results in a difference in the amount of waste water. Nano recovery rates are between 70 and 80 percent where reverse osmosis is between 65 and 75 percent. Technology today has made great strides in reverse osmosis technology. There are a variety of new membranes to choose from. With the introduction of low energy membranes, systems now can be powered by smaller pumps and reduced pressure on the entire system. This lower pressure has the effect of reducing the maintenance and operating costs. If your water report shows a high mineral content, Nanofiltration may not produce the quality of water you’re looking for. With the RO system, you use a blending valve to set the exact level of TDS you want in your brewing water. One reason RO and Nano systems are widely used is that the system and maintenance of the system are fairly simple. When it comes to maintenance on RO systems, consistent maintenance and pretreatment are the keys. You should keep a log on the system’s performance. By logging the RO’s performance level, once or twice a month, you know the efficiency level of the unit. You could head off costly maintenance problems, when you see the system slowing down, if you do this. With proper pretreatment for your system, your membranes should last year’s. Your main concern is to change your pre-filters on a regular basis, based on your log numbers. Check your carbon system and carbon filters to ensure that no chlorine hits the RO membranes. When it comes to costs for pre-filters that depends on the type of system and the size of the filters you have. Costs range for sediment filters from $6-$20 apiece, to carbon filters, ranging from $15-$80 apiece. The best long term option you can have for your reverse osmosis system is a backwashing carbon or catalytic system. A catalytic system is more expensive, but filters a wider variety of chemicals and uses ½ the water for the backwashing cycle. The use of an Antiscalant unit for your RO system is a great way to pretreat your RO unit. 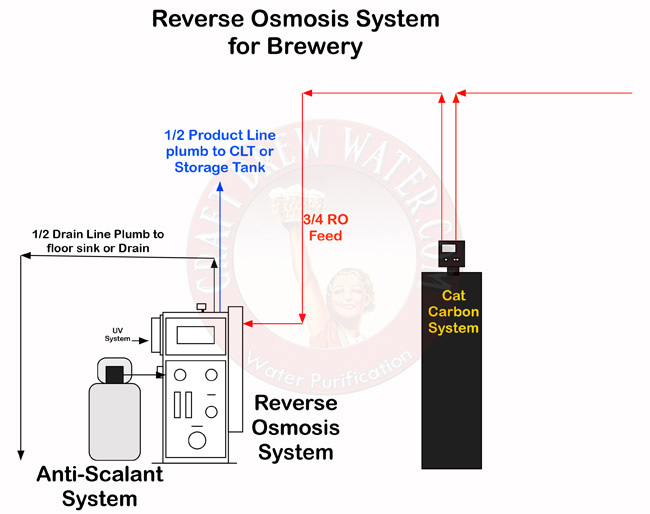 A properly maintained reverse osmosis system will give your brewery consistent brewing water quality every time. General difference between Nano and Reverse Osmosis. Simply put, these two processes for filtering water are very similar to one another in function; however, the end result is quite different. In most cases the physical appearance of the units are identical until you get to the elements or membranes. A Nano membrane has a different weave or pore size which will allow some of the natural minerals of your feed water to pass through the membrane but will remove contaminants and many unwanted organic substances. This process usually allows for a recovery rate of 70 to 80 percent relatively speaking. The end result is a cleaned water with a higher TDS (total dissolved solids) then Reverse Osmosis. A Reverse Osmosis membrane has a different weave and smaller pores to filter your feed water. This requires a higher pressure than nano and will give you a much purer water to start with. For example, if your feed waters TDS is 400 PPM (parts per million) you could expect a Nano system water reading between 40 and 60 PPM. A Reverse Osmosis system with the same feed water will produce a finish product under 10 PPM with a recovery rate of 65 to 75 percent. Technology today has made great strides in reverse osmosis technology and there are a variety of new membranes to choose from. With the introduction of low energy membranes, systems now can be powered by smaller pumps with reduced pressure on the entire system. This lower pressure has the effect of reducing the maintenance and your operating costs. If your water report shows a high mineral content, nanofiltration may not produce the quality of water you were looking for. With a Reverse Osmosis system in conjunction with a Blending Valve, you can set the exact level of TDS by blending back in your natural feed waters minerals into your product water thus giving you the best water profile for your brewing needs.